I'm definitely pleased and impressed to see these. So, Alan, tell us more! And tell us about that last name of yours - coincidence? So did I miss something? What's the story. Was this bass built by Ken Parker and is he a relative? Seems strange that a relative of Ken's would frequent this forum. If for no other reason just out of loyalty to Ken. Where is Ken's label/sig on the bass? Sorry for being so skeptical. Just so many stories have been told here. And the Cedar Deluxe. Would it not be more like an Artist than a Deluxe? I don't think Ken would call a Cedar fly a deluxe. Cedar neck, poplar body? CP. Cedar Deluxe. I would have thought Cedar too soft for a neck but I guess the carbon exoskeleton unibody takes care of that. Looks like KP to me. I think he tries different woods early on. We know about the Redwoods. Yeah the bass looks like a very early KP to me too although I wouldn't really call it a Fly. Very cool on both counts. Just because someone might be related doesn't mean its disrespectful to drop in. The pickups look very much like the ones on my '69 Gibson EB3, and the tuners also look like what Gibson was using circa early '70s. I have seen this one before Bill and it is obviously KP and a predecessor to the Fly. That bass actually had a lower horn and it either broke off or was cut off, I can't remember which. 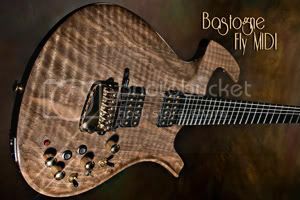 I don't see Ken's design genius or workmanship in blackfly's bass. I also wouldn't call my fly "cedar" just because its neck is cedar. That's misleading. I don't refer to my bastogne fly as a basswood fly. It is obviously a pre-refined fly. Hard tail at that. Tuners look new to me. Not 27 years old. In 1973 I guess Ken would have been a teenager. Who knows, but it certainly is possible. And on the other hand,why would anyone care enough to make it up ? I have no idea either way, but on the other, other hand, why would it matter enough to anyone to doubt it? I have been studying existential guitar theory way too long. in northern Vermont. He took a class in furniture-building and made a fretless bass for his brother Alan"
You haven't done your homework. That other well-known bass had a detachable lower bout, something similar to what we see on the bass above. Ken reportedly made it that way so he could experiment with different bout designs. PS: It's perfectly natural to have doubts about identities and the authenticity of rare instruments, but your posts could be a bit more polite about it. If blackfly were offering the bass for sale, that would absolutely justify rock solid confirmation of everything. Since he's not, and since he could be a great source of interesting Parker history, you might think about getting an apology ready - just in case. I have no reason to doubt that it is Ken's work and it has many clues that I would have guessed it to be Ken's if not told. I would love to know more especially if he started with a found object for that leg support. I don't mean to be disrespectful to anyone and I apologize right now if anyones feelings are hurt. The story just sounds fishy to me, that's all. If I'm wrong then I'm wrong and that would be cool. As Bill pointed out, the background to the story was easy to get. Took Bill five minutes and I've read that story too years ago. I guess as long as these instruments don't show up for sale there would be no reason to fabricate the story. It will be interesting to see. And I wont even care who believes the story or not.